While as for the educational institutions, they will get Lion at $39.99 per license with a minimum order of 25 licenses as part of the Apple Software Collection package, which includes OS X, iLife and iWork. Existing Volume License, Maintenance, and Apple Education Licensing Program customers will receive one redemption code for each contract that can be used to download Lion from the Mac App Store. That single copy of the Install Mac OS X Lion application is used to install Lion on other Mac systems at the school or business. Once the install app has been downloaded, administrators just copy it to the target systems and run the installer. Administrators can use the System Image Utility in OS X Lion Server to build NetInstall (link to PDF) or NetRestore images to assist in performing mass deployments. 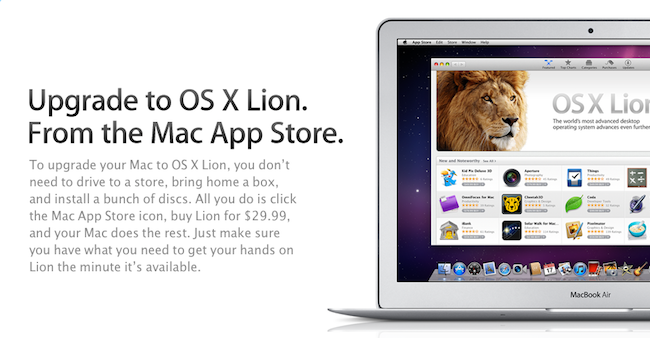 As for the updated news about the download, OS X Lion will come out in July at $29 exclusively on the Mac App Store.